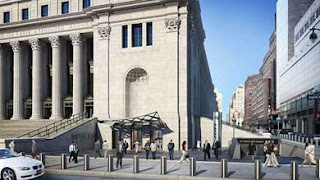 ﻿﻿ After a decade of political wrangling which included plans as wide ranging as a complete demolition of Madison Square Garden to the construction of a football Stadium for the New York Jets, it appears that construction will finally begin on moving and expanding large parts of New York Pennsylvania Station. 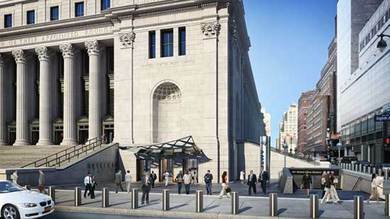 The first part of the project is estimated to cost $270 million and will transform NYC’s beaux arts main post office into a new Amtrak station, giving more room to NJ Transit’s cramped commuters. What will eventually be known as Moynihan Station, named for the former senator from New York, has a total project price tag of $1 billion. Penn Station is currently the busiest train station in North America, with over half a million people commuting through the terminus every day day. The new configuration, which includes new street entrances on 8th Avenue, is expected to cut in half the time it takes for the average commuter to get from the street to the train, and vice versa. The project is to be principally paid for by the federal government, and the Port Authority of New York and New Jersey, who also own the World Trade Center site, have taken over responsibility for the Project, as requested by the New York Governor, Andrew Cuomo.